With the breakneck speed at which new DSLRs are released, photography seems to have traded a bit of its soul for the pursuit of ever more megapixels. So, Carl-Frederic Salicath of Norway has taken a step back from the digital revolution and has built his own working retro 120mm-film camera. Here's how. 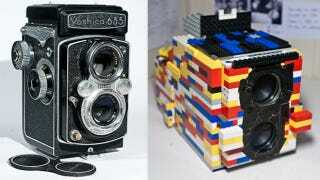 Dubbed the LEGOflex B1, the camera mimics the style of classic style of the Rolleiflex designs. The exterior is fabricated exclusively from the brightly-colored building blocks. Its interior employs a few Technic pieces to secure the roll of film and prevent it from unwinding. He affixed a pair of binocular lenses and employs a separate Technic piece to act as the aperture. It even includes a viewfinder.